Greenland (Greenlandic: Kalaallit Nunaat; Danish: Grønland) is the world's largest non-continental island, in the far northeast of North America, largely within the Arctic. Although it is still part of the Kingdom of Denmark, it was granted self-government effective in 1979, more recently it voted for more autonomy, in effect making it a separate country with formal ties to Denmark. Some inhabitants are now projecting the eventual road to full independence. Copenhagen remains responsible for its foreign affairs and, of course, is a source of investment. The closest neighbouring countries are Iceland to the South-East, Canada to the West and Svalbard in Norway to the North-East. Although some maps with flat projections of the globe tend to make Greenland look the size of Africa, it is actually "only" about the size of Mexico. Greenland has the world's lowest population density. According to the Icelandic Sagas, Erik the Red chose the name "Greenland" to entice settlers from Iceland. In fact, Greenland has far more ice cover (about 84% of its surface area) than Iceland does, but the southern coasts the Vikings settled are green in summer, and were likely more so during the Medieval Warm Period. Be careful with maps of Greenland, as many Greenlandic names simply reference a particular geographical feature. For example, "Kangerlussuaq" means "Big Fjord" and so is not only the Greenlandic name for Søndre Strømfjord. When visiting a city or village don't be afraid to ask for directions of shops, places to eat or somewhere to sleep, even if you think there might not be any. Most places (even Nuuk) are small enough for everyone to know where everything is, and therefore no one bothered to put up a sign. Don't be surprised to find a fully equipped supermarket inside a grey factory-like building in the middle of nowhere. Location of the capital Nuuk (Godthåb). Although Greenland is part of the Kingdom of Denmark, due to its near-independent autonomy it is not a member of the European Union, European Economic Area or Schengen Area. As such, with a couple of exceptions, immigration restrictions are applied to all non-Nordic (Danish, Swedish, Norwegian, Finnish, Icelandic) nationals, including citizens of other EU member states. Canadians who are members of certain Inuit First Nations in the territory of Nunavut. Citizens of Albania*, Andorra, Antigua and Barbuda, Argentina, Australia, Bahamas, Barbados, Bosnia and Herzegovina*, Brazil, Brunei, Canada, Chile, Costa Rica, El Salvador, Guatemala, Honduras, Israel, Japan, Macedonia*, Malaysia, Mauritius, Mexico, Monaco, Montenegro*, New Zealand, Nicaragua, Panama, Paraguay, Saint Kitts and Nevis, San Marino, Serbia*/**, Seychelles, Singapore, South Korea, Taiwan*** (Republic of China), United States, Uruguay, Vatican City, Venezuela, additionally persons holding British National (Overseas), Hong Kong SAR or Macau SAR passports. All others will require a visa. Keep in mind that Schengen area visas issued for visits to mainland Denmark are not valid for Greenland or the Faroe Islands. You will need a separate visa, which can be applied for at any Danish diplomatic post or embassy along with your Schengen visa for Denmark or Iceland if you are transiting through one of those countries. If you are flying through Nunavut, you would need a Canadian temporary resident or transit visa. If you're planning work or study in Greenland, you'll need an appropriate permit, although some types of work (teaching, consulting, artists, installation technicians, and a few others) as well as short term research are exempt from needing a work/ study permit if the time spent in Greenland is less than 90 days. For more information see . There are no border checks when entering/exiting Greenland, and customs screenings are usually "behind the scenes", so if you have anything to declare or need your passport stamped (eg for a residence permit) you will need to seek out border staff yourself. If you stay on the typical tourist paths you do not need any permissions, but any expeditions (including any trips to the national park, which by definition are expeditions) need a special permit from the Danish polar centre. If travelling with an agency they will usually take care of the paperwork for you. If you are entering or travelling through Thule Air Base, you also need a permission from the Danish department of foreign affairs, since it is a US military area (except for children under 15, Danish police and military, US military or US diplomats). See Qaanaaq for details. 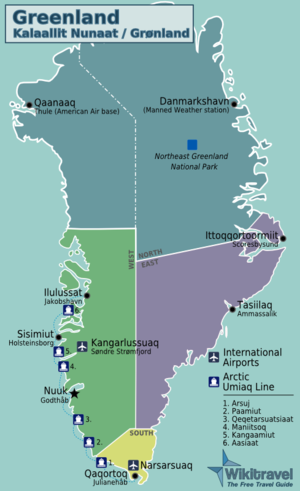 Trans-oceanic service to Greenland either lands at Kangerlussuaq (IATA: SFJ) (Danish: Søndre Strømfjord, English: Sondrestrom), or Narsarsuaq (IATA: UAK) the only airports in the country which can accept anything larger than a turboprop. Ilulissat (IATA: JAV) and the capital Nuuk (IATA: GOH) are seeing an increasing amount of international traffic from Iceland in the summer. SAS ceased its operations to Greenland in 2009 and Atlantic Airways sometime before that. In 2015, Air Greenland stopped running their seasonal route from Iqaluit in northeastern Canada, so that it is now only possible to get to Greenland from Denmark or Iceland. Getting to Greenland is expensive, although sometimes travel agents are able to get discounts through agreements with Greenland Tourism. Year-round, a daily return between Copenhagen and Kangerlussuaq with a second daily return in the summer season contracted out to Danish carrier JetTime. From Kangerlussaq, you can reach any other city or settlement in the country, including the capital Nuuk, through Air Greenland's domestic network. Seasonally, Air Greenland has several departures each week between Copenhagen and Narsarsuaq, operated by JetTime. June through September, two weekly returns from Keflavik Airport in Iceland (Icelandair's hub) to Nuuk. There is also a seasonal service from Keflavik to Ilulissat. With plentiful flights between the United States and Iceland, this is the easiest way to get to Greenland from North America. Air Greenland only sells tickets through its own website and travel agents, fares are not advertised on Expedia, Priceline, or any consolidator website. Despite minority ownership by SAS, Air Greenland is not part of the Star Alliance network nor has codeshares through SAS or any other major carrier. Interlining baggage and a single reservation may be possible - consult your travel agent. Air Iceland  operates year-round flights from Reykjavik to Kulusuk and Nuuk and additionally to Narsarsuaq and Ilulissat during the summer months. Bear in mind that Air Iceland is not the same carrier as Icelandair, operates out of the downtown Reykjavik airport (domestic and Greenland flights only), rather than the international airport at Keflavik, which Icelandair uses. Since 2016, however, most Air Iceland flights to Greenland have begun departing from Keflavik. If you are vacationing in Iceland, one popular day excursion is to fly from Reykjavik to Kulusuk, where traditional handicrafts are on sale, before returning to the comparative comforts of Iceland. There are also numerous charter outfits serving Greenland from Europe and North America, and frequently if you're on a package tour to Greenland from North America a chartered flight is included. Scientific and technical personnel travelling from North America for research purposes typically fly into Kangerlussuaq aboard New York Air National Guard C-130s. Greenland's airports are very private aviation friendly if the weather is right, the name of Greenland's airport service is Mittarfeqarfiit. Oceanwide Expeditions  explores the most remote places in and around the Arctic region with their own ships and expedition crew. Passengers are taken to remote locations such as Disko Bay, Scoresby Sund, Aasiaat and Maniitsoq. Exploring the Greeland coastline, passengers can enjoy the wildlife and dramatic views of Greenland scenery. Hurtigruten and Silversea have cruises to Greenland going from Iceland. There is no road or rail system. The easiest way to get around Greenland is by plane, particularly Air Greenland, although flights are very expensive due to Air Greenland's monopoly. 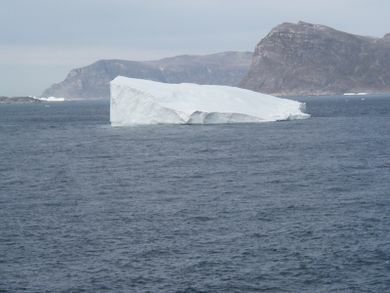 For about nine months of the year, Arctic Umiaq Line a passenger ship provides service to destinations between Qaqortoq and Ilulissat along the west coast. Animal life - Whales, seals, walruses, musk oxen, reindeer/caribou and polar bears. The official language - Greenlandic (Kalaallisut) - is actually that of the more populated western coast. The eastern dialect is slightly different. Both are highly challenging languages to learn, as words are very long and often feature "swallowed" consonants. Try uteqqipugut or Ittoqqortoormiit on for size. The good news is that Greenlanders are taught Danish and English from an early age. Almost all Greenlanders are bilingual Danish speakers which was official, and most have at least a functional command of English. Greenlandic words may come in handy for travellers wanting to experience the "real Greenland", though. There are four languages in Greenland: Western Greenlandic or Kalaallisut, Eastern Greenlandic or Tunumiisut and the Thule Inuit of Greenland and Danish as a second language. Like the rest of the Kingdom of Denmark, the official currency is the Danish krone (DKK). In tourist heavy areas, other currencies such as Icelandic króna, euros, pounds sterling and US dollars may also be accepted (but always ask first). Greenland is still largely a cash economy. With improvements to the infrastructure over the past few decades, the number of merchants accepting credit or debit cards are steadily growing, although many still do not. As a general rule, unless you're dealing with hotels or mainland chains with a presence on the island (e.g. supermarkets), don't automatically expect that credit cards are accepted - carry some cash as a backup. Every settlement has at least one ATM and if all else fails banks may be able to give you a cash advance from your credit card. Duty-free -- most flights land at Kangerlussuaq, one of those lovely places on earth where you can buy duty-free after landing. Stock up on cheap booze, smokes and everything else at prices far lower than the rest of Greenland. Important: Greenland is not a member of the EU, so although you may be travelling from Denmark, the custom rules are the same as for a trip out of the EU. Food in Greenland is generally not that different from American or continental European tastes. Restaurants carry typical European fare. Local food can be purchased at local markets in each town. Many Greenlandic restaurants combine traditional foods (locally-caught fish, shrimp and whales; also muskox and reindeer) with more familiar dishes. Expect to find whale meat at a Thai restaurant and caribou in a Chinese joint. Nuuk also has several burger bars and a couple of very high-end restaurants, most notably Nipisa, which specializes in (very expensive) local delicacies. Prices are high everywhere, but servings are generally large, especially with fries. A local speciality is Greenlandic coffee. Its creation in some places is pure performance and it hits hard: its coffee laced with liberal amounts of kahlua, whisky and Grand Marnier. One of the best places to buy is at the Sukhumvit Thai Restaurant, for about CAD22. Accommodation in Greenland tend to be pricey. World class hotels exist in all of the more visited areas (Hotel Hans Egede in Nuuk, Hotel Arctic - with its igloo rooms - and Hotel Hvide Falke in Ilulissat), but cheaper options exist. Try for the Seaman's Home hotel in Maniitsoq, Nuuk, Sisimiut and Aasiaat. There was a good Seaman's Home in Qaqortoq, but it is now permanently closed, leaving as the main option only the much pricier (but very nice) Hotel Qaqortoq. Narsarsuaq also has a good (and not quite as expensive) hotel, as well as a much more economical hostel. For less expensive options, you can check with the Nuuk Tourism office for its hostel program, where locals have rooms they will rent out for a third the price of the town's hotels. It's a great way to experience the real Greenland, although knowing a few words of Danish or Greenlandic is very helpful as your hosts may or may not understand English. Additionally, since there is no private property ownership in Greenland you can also camp in any field or plain for free if you're equipped to handle the elements. University of Greenland in Nuuk. Tele Greenland is the only telephone and internet provider. Mobile phones have coverage in all larger villages, including 3G internet access. Note that roaming charges are international (as Greenland is outside the EU), and much higher than someone from EU would pay inside EU. Thanks to undersea fibre optic cable links to Europe and broadband satellite, Greenland is well connected with 93% of the population having internet access. Your hotel or hosts (if staying in a guesthouse or private home) will likely have Wi-Fi or an internet connected PC, and all settlements have an internet cafe or some location with public Wi-Fi. Ask around if you need help finding it. Kalaallit Nunaata Radioa (Radio Greenland) broadcasts one national radio station with a wide variety of news, music, cultural, and entertainment programs, primarily in Kalaallisut (Greenlandic) but some features (particularly news) are also in Danish. In Nuuk only, a second frequency re-broadcasts Danmarks Radio from Copenhagen. Kalaallit Nunaata Radioa broadcasts KNR TV nationwide, with a similarly broad selection of programs in both Greenlandic and Danish. Many settlements have a secondary commercial television station - such as Nuuk TV and Sisimiut TV with locally produced news, current affairs and entertainment programs. Nuuk TV also offers Nuuk TV Digital an encrypted over the air digital network available by subscription. 40 channels are available, comprised of Danish terrestrial networks (DR Television), Canal+ movie channels, and several Danish and international cable networks, such as CNN, Discovery, etc... If you're staying in Nuuk and your hotel or guesthouse has Nuuk TV digital, some of these channels are in English. Terrestrial TV networks do not broadcast around the clock. KNR Television has a breakfast news program from 6am-11am, closes down until 4pm and then signs back on for the evening program until midnight or 1am, hours are expanded slightly on weekends and may be expanded further for football or other sports coverage. The local commercial stations only broadcast in the evening. Nuuk TV Digital, however, is on the air 24 hours a day. The word "Eskimo" is considered pejorative by many Arctic peoples, especially in Canada. While you may hear the word used by Greenland natives, its use should be avoided by foreigners. Use the correct term "Inuit" and when specifically referring to people in Greenland, Kalaaleq, "a Greenlander." This page was last edited on 29 March 2019, at 21:07.